Damn, they're trying to kill me! As a dive instructor I'm heavily insured. The greatest fear (and most common joke) is returning with one fewer student than you start with. But honestly, the danger is for the instructor more than the student. And yesterday I was reminded of that. We spent last evening in the pool, finishing the last of the pool training dives. I demonstrated 2 variations of the Scuba Unit R&R skill. That's the removal and replacement of your scuba gear (buoyancy vest and tank), while underwater. On the second go, my right arm snagged. My wrist-worn dive computer caught the shoulder strap and the motion of trying to lift the unit over my head and onto my back instead twisted the strap about my wrist. Mildly embarrassing. But. Just as I was about to undo the motion and free my arm one of my students rushed forward. From his perspective it looked like the reason my demonstration had stopped was that my snorkel was caught in the buoyancy vest. So he pulled it loose. And pulled my mask off in the process. Now I wasn't happy, but it gets better! Apparently the jerk to my face, which was already at the very end of my regulator's hose, was enough to half pull the regulator out of my mouth, and that change in pressure was in turn enough to cause my reg to free-flow. So suddenly I found myself underwater entangled, mask-less, and with a regulator delivering hurricane force air to my mouth. I looked down for my mask but could see nothing through the cloud of bubbles. I learned (as all do) how to breath from a free-flowing regulator in my initial scuba training. And as part of that training we all learn how to do without a mask. And I know how to handle underwater entanglements. I've never conceived of all three at once! Bloody students are trying to kill me! Clearly I'm well. In fact after a brief breath at the side of the pool (not easy to get to) I carried on with the lesson as if nothing had happened. Today we went out for the students' third open water dive and the same student punched me in the mask. He felt really bad afterwards but I told him that after yesterday's training, a little water in my mask was nothing! Overall, pretty embarrassing at the pool, but also sorta kinda funny. And a whole lot of fun! I'm a writer and someday I'm actually going to write something. Not a blog, but a novel. Novels. They'll be filed in the fiction section and I'll give Dan Brown a run for his money when it comes to pseudo-history! While he may scour libraries for obscure bits of theory, I'll simply be writing what I know. The critics are going to say I over develop my characters. That they're too complex and don't follow the archetypes properly. They'll say that no one goes through life with happening after happening and reacting to it all in that way. But I'll just smile smugly. Your antagonist can be an adventurer, exploring the mountains and oceans. Or a lover, with a life so complicated you can't follow the characters without a plot summary. Or they could be a mover, working multi-million dollar deals and travelling the world to do so. It's even believable to centre the story around a simple man content with a simple life. Or of a flawed man who ever so slowly improves. But no one will believe a book with all the above in a main character who ultimately will be just another face on a crowded street. And if every supporting character is equally as complex?!? Impossible! A few will buy the books but few will buy into it. Regardless, some day I'll sit down, take a year or ten, and write it all. I hope it has a happy ending. Amsterdam has at least two, often three entirely different cities sharing each place on any given day. Some places that are full of hardware stores and elementary schools suddenly spring restaurants in the evening. Bars dominate some of these same areas at night. The never-empty streets are later occupied by people you'd never want near your neighbourhood school. Until the light of morning when the last of the misanthropes move out and giggling children again return to school. And midnight is the most dramatic of all the shifts. The trams and buses take their last rides to the edges of town as the (respectable) night clubs are opening their doors. (Sure some might have been open at 10pm. But no one shows up until 1:00.) Restaurants close their kitchens by 10:30 and by 11:30 the well fed customers are grabbing their aforementioned last bus. So midnight is a brief, brilliant mix of two portions of the city. A moment of chaos transitioning from the respectable to the unspoken. There isn't a specific time in the morning when the last partier goes home. There is no time such as 5:15pm when the all the office workers become cafe sitters. The various stages of the city transition slowly. But at midnight... ah midnight in Amsterdam. Rogier is my roommate. And over the past couple of years he's been a pretty good one. No where near as clean as I am, he's not messy. Often out late, he tries to be quiet when he comes in. We've gotten along over the years mostly by keeping opposite schedules and time-sharing the living room as much as coexisting in it. So it's with real happiness and excitement that I congratulate Ro on his new acquisition. He's bought a house! Come December he's moving! Out of here! Yeah! Oh, and into a new home with his girlfriend and co-house-owner. Over the years I've grown used to sometimes having to wash his dishes to make space so that I could cook dinner. Darn, in the future all the dishes I wash will have to be my own. The one univeral truth about my weekends in Amsterdam is that there's no sense making plans. I always have nice weekends but they're never what I was intending. For a few weekends this summer this meant that I didn't dive when I planned to. This weekend, I am diving when I didn't plan to. Dancing isn't going to happen. So plan B is to follow Adam and Tobias who both insisted that with or without me, they were going. After many missed Saturday nights the goals for this weekend included: getting drunk, going dancing, staying up all night, and not diving. Last night was short. Sleep was long. The day has been slow. But I don't have the energy for dancing. Tobias and I picked up his gear from the dive shop today. And we got three tanks, in case I wanted to come along. Well now my gear is packed, my evening is restful, and the tank awaits. So to heck with plans, tomorrow I'm (surprise) going diving! Rarely do I nap if not sick. But I have plans to enjoy myself as much as possible this weekend and while the mattress at the hotel was quite soft and the pillows were huge, the bed still wasn't entirely comfortable. It was a hotel. Again. So I'm going to take a quick nap before truly meaning it when I say," Woohoo, I'm home!" I'm sorry to report there are no pics of Copenhagen because I never made it into the city. While downtown was only a short bus ride away, the 11-hour long show caused physical discomfort and low energy for all the staff. Two of the Danes left last night while the other one and I had dinner back at the hotel. After a couple hours of Harry Potter it was bed time. Damn, I'm being guilted out. I forgot I told a friend we'd consider plans for dinner Friday, and due to a precipitation of events in their schedule, I'm now being waited for. Okay, this still leaves time for a nice warm shower, a shave, and a change into fresh clothes. What I think of as "de-airlining" my person. It's just as well, since I probably wouldn't have slept well had I tried to nap. And I'm probably really not that sleepy in that once home I checked my email and wrote this blog post. *grins* Okay, it's Friday night and woohoo! I'm home! Now it's time to go out. Trade shows are boring. Deeply deeply boring. And "working" the show is even worse. Still, I'm in Denmark eating real Danish food and hearing crazy languages all around me. And the people I'm working with (just met) seem really nice. Any way, the point of this post is not about how boring the show is. I was getting demands for pics from Denmark. As this show is the only thing in Denmark I've seen, suffer through these. These are the guys I'm working with. That's my laptop on the right! Yippee! The lunch was really quite nice! For those bored enough to ask... it's a broadband network convention. So people are selling software (that's me! ), tools, and the actual materials to make things like fiber-optic networks. With only four hours sleep behind me, I managed to get my plane this morning. Thank goodness for auto-pilot. Not on the plane, but the one inside my head that makes it possible to shower and dress before my eyes are fully open. Alas, there's nothing here in Copenhagen for me to see. Once again, my hotel is in a business park close to the airport and no where really near the downtown. But apparently I'm close to the trade show I'll be attending tomorrow. 11 hours of manning a booth and "trying" to sell software. I say "trying" and not trying because I don't sell. I have no idea why I was invited to attend and I'm here with semi-functional software demos that are completely unrelated to the new software my company is releasing in 2 weeks. Futile? Oh yeah! Oh well, at least now I can add Denmark to the "been there, done that" list. Well, "been there" at least. I'm sure the TV news won't let us forget, and we should all take a moment to remember that today is September 11th. But in the overal, I hope today is best remembered as "just another Tuesday". May our world be uneventful and your day quiet. Over the past year You Tube (and Google Videos and the rest) have started to become a legitimate form of entertainment for me. I've had nights where the online videos were more interesting than anything on TV and even once when I shunned one of my all time favourite shows in favour of the online offerings. Some of the most common searches I make involve music. An old song is in my head... 30 seconds later its playing on my computer. Woohoo! I see a song title on TV, moments later, I'm watching the video. Here's an example of three I've visited often. Bob Marley is classic. But this particular video uses a techno'd-up, Euro-beat remix. After back-to-back listening with the original, I chose to post this one. Toe tapping. Titled "Sun is Shining" you might know it better by the lyrics "I'm a rainbow too." This song makes me happy. Fatboy Slim is also techno. But good luck pinning his work down more than that. I like everything Fatboy Slim has done. But I'm too lazy to buy more albums. All the best stuff is available on You Tube! While slightly dark, I love this video because of the airplane and the pilot who goes nuts. Lucky bugger. Watskeburt? It's hard to explain, but this Dutch slang means "what's happening?" in the way that "s'up?" means "good evening gentlemen, what news is there to share?" De Jeugd Van Tegenwoordig are a local Amsterdam band. I recognize most of the backgrounds in this video. Make no mistake, the song is complete crap! But it has a certain catch to it that made Mambo #5 and works of similar quality into hits. Standing back and looking at this collection I notice a trend. While from different countries (Jamaica, UK, and Holland) and spanning 40 years (70's, 90's and 00's) they're all dance songs. Perhaps I should take next weekend and spend a few hours on a dance floor? The head cold is over, and like any one would, I immediately started over-doing everything the moment I felt human again. I taught in the pool last night. Got home from work at 5:50 and was back out at 6:00 again. My two students and I had dinner, reviewed their academic work, briefed and explained the skills for the upcoming dive, then got all the gear needed from the shop and helped load it into the van. After a fun time in the pool we went back to the shop, helped with the unloading, then went out for a beer and debriefing. It was 1:45am when I got home. This morning I woke up and spent an hour on the phone arranging logistics. Then three of us met up at the dive shop and compiled and loaded all the gear for the 6 of us diving this Sunday. 4 sets of gear rentals, 9 tanks of air and various sundry bits and pieces. And I'm renting is all. Wow, I just got 9 tanks of air! Tomorrow I'm trying to fit three dives into an afternoon. Starting from 2pm, I plan to quickly hit the water with the OW students and do their first ever "real" dive. Then I'm taking Tobias and Ingrid out for their first training dive for their Advanced OW certificate. We'll be practicing underwater navigation. As soon as they're done, I'll be back in the water for the second dive with the OW students... and by then everyone will be tired and I'll be exhausted. Next weekend, I'm booking off from diving. I know by then I'll probably need a sleep-in. Damn this feels good; soaked in sweat, every part tired, hands so weak they're shaking. After a June, July and August without the gym, I'm finally back. My body is addicted to exercise. It's a true physical addiction, because when I stop, the symptoms are unbearable. Every pulled muscle and old injury I've ever hard will creep back and start to bother me... unless I exercise. Then it just all goes away. Done properly, 2 or 3 trips a week keeps everything running smoothly. Physically, mentally, I benefit from (hard) physical activity in so many ways. It's holistic. And without it, like the past month or two, everything hurts. Nights become more for TV than for me. And that's not good. But this is the best addiction I've heard of. And it takes so little to get me back into it. Exercise makes me want to eat well; not lots, but nutritiously. And of course it forces good sleep. Eleven o'clock doesn't magically become one o'clock in the morning without sleep. When I put my head down, I sleep better, and thus feel better the next day. Full of energy and highly motivated to return to the gym. It's not been a bad day. But I'm going nuts, quietly. Sick lately, I worked from home today. I got my work done, but didn't have enough to do to use up even my limited energy. Currently every project at work is awaiting further information via email. Until then, any effort applied is likely wasted effort. And it seems many facets of my personal life are awaiting emails. For example, after patiently waiting I have found that PADI has lost part of my paperwork. I'm not yet certified to teach CPR, per the course I took and passed last May. I have to contact my instructor, but to find out his email address I've had to contact the resort manager in Bonaire. But I think everyone in Bonaire is busy right now. Three days at home is all it takes to make me stir crazy. Although it takes more strength and energy than I currently have to get me out the door. Here in Holland, people usually take most of their 4, 5, or 6 weeks of vacation time during the summer months. Europe in general tends to take "the summer off". As a result, there are few (no) public holidays at this time of year. In Canada, however, life centres around summer long weekends. People hibernate all winter in their homes dreaming of finally being able to enjoy the summer sun and a bit of free time. This hibernation is officially ended on May 24th, the Victoria Day weekend. Known as Memorial Day in the U.S., more commonly known as the May Two-Four in Canada, this is the unofficial start of summer. And Labour Day (shared in both countries) marks the unofficial end. If you have a summer home in Canada, this is the weekend that the boat came out of the water, the heater got it's winter service, and all your friends stayed over for the weekend to help with the work and to drink your beer. Today people with hangovers will pack the highways with cars and campers and boat trailers as they wearily drive home to their daily worries, jobs, and eventually to their winter hibernation. Sorry to hear your summer is over. I hope no one tells the weather. Aside: Ironically I've been sick this weekend and called in sick for work today. It wasn't my intention to not work on Canada's most important summer holiday, but that was the result. I'm with you in spirit... even if I don't have a hangover or sunburn or stories of water skiing. My old coworker and brother in crazy, Felix, is coming to Amsterdam in a few weeks. But the title isn't for him. 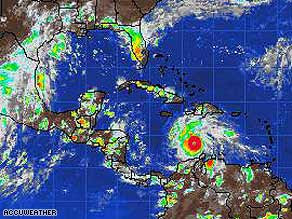 It's for hurricane Felix who had to nerve to scare people in the Dutch Antilles! These two photos are stolen from CNN. The radar shows Felix in the Caribbean Sea very shortly after passing the ABC's (Aruba, Bonaire, and Curacao). I think everyone will remember that Bonaire has stolen a place in my heart. You can still see small areas of reef damaged in 1997. Only tiny bits of coral and the occasional anemone inhabit the areas of broken, bleached coral. So thank you Felix for not hitting the island again, but gosh, that was a bit close. 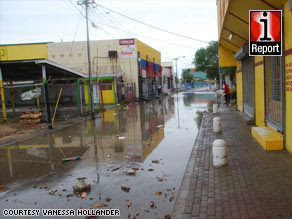 Flooding, winds, and rains did their worst but the destruction is by no means hurricane level. I can learn a lot from CNN. The storms just missed, streets flooded, no one died. But where do I go for up to the minute coral news??? I'm going to have to email people there directly to find out. Damn this frail human body! I'm not going diving today. I'm going to follow my friends along to the dive site, and watch and help while they go. But there's no way I can put my head in the water without blowing out my ear drums. Just yesterday I told a friend that I would keep up my current pace of work and travel and play and diving until it made me sick. At the time, a small allergy attack was affecting me, but I thought it would be temporary. It didn't abate last night, and I awoke this morning with a fully stuffed head. When diving it's important to equalize the pressure in your sinuses and inner ear with the ambient pressure at depth. Snot prevents this. Meaning that on the way down you experience pain as the pressure builds until eventually something breaks. I've met a diver who could blow bubbles out his ear. While an amazing party trick, this is by no means a desirable thing. Sure nature didn't design us to live underwater. But our glorious intelligence and technology has overcome these mere physical limitations. Hasn't it? Mostly. *sigh* Some days I'm reminded I'm still only human and have physical limits. No matter how much I don't like it. Update: Two hours later, and I've bailed entirely. I sent Tobias on without me. I'm going to take advantage of my stuffed head, do the heavy dusting, and then consider an afternoon nap.